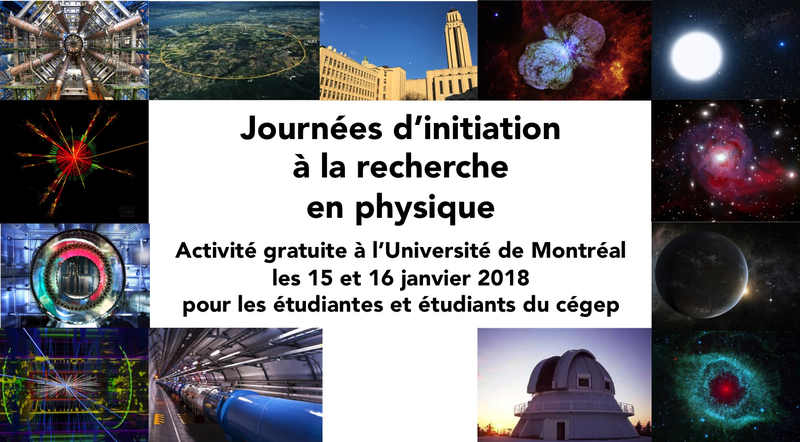 Researchers of iREx are happy to contribute to the Journées d’initiation à la recherche en physique, an event organized by the Department of Physics of the Université de Montréal. 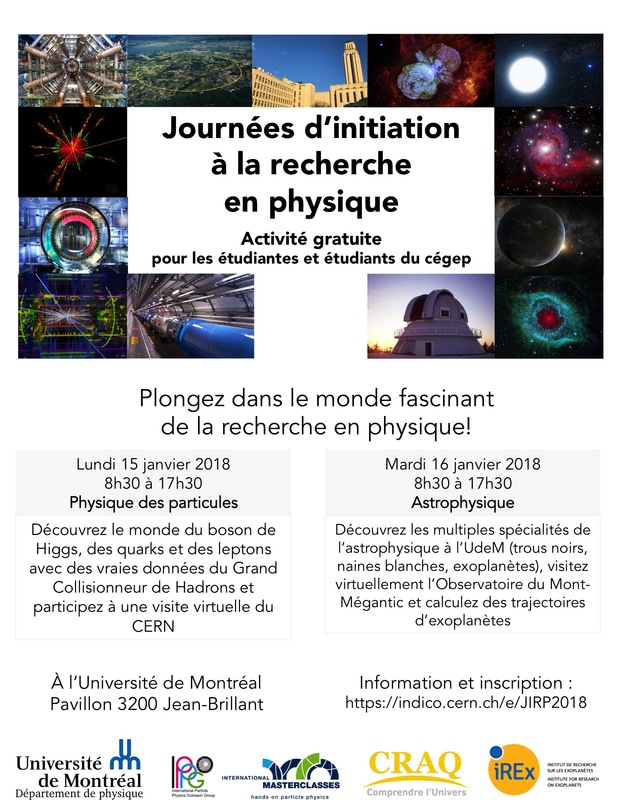 This free activity, intended for cegep students, will take place January 15 and 16 2018. During these two days, they will have the opportunity to meet professors, researchers and graduate students in physics, and to become familiar with two areas of research in physics. – The first day, Monday, January 15, will be devoted to particle physics, which is the field of the extremely small, the world of quarks, the Higgs boson and particle accelerators. This introductory day is in its fifth edition this year, it was previously called the JIPPUM (Journée d’Initiation en Physique des Particules à l’Université de Montréal). – The second day, Tuesday, January 16, will be devoted to astrophysics, which is the study of the Universe, the galaxies, stars, and planets it contains. This year will be the first edition. Students can register for one or both of these days at https://indico.cern.ch/event/682219/. If you are a teacher and wish to participate, please do not register on the site, but instead send an email with your name and the name of your cegep to the address below, we will welcome you with pleasure. Note that the presentations will be in French, but all speakers are bilingual, so you can ask questions in French or English. The full program for the two days, the directions to get to UdeM and the list of speakers are also on this site. Places are limited to 90 students each day and will be based on a “first come, first served” basis (applied automatically upon registration). If you want to print the poster to publicize the event in your cegep, it is here in PDF format. Thanks to Neil J Cook for the revision of this text.